Last Friday, August 7, I served as the DJ and MC for Britni and Ryan Mushrush at Five Oaks Lodge in Jenks. 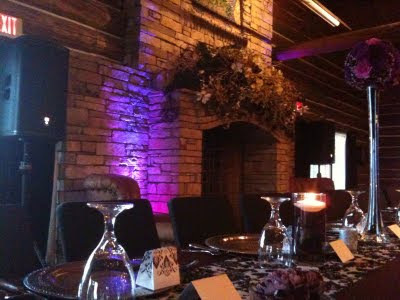 I also enhanced the ambiance a little by uplighting the stone fireplace with LED lights - the lights were set to purple to match their wedding colors. The reception was beautiful, and the guest had an absolute blast! They ended the night by having everyone light sparklers right outside the entrance and then form a tunnel for the couple to run through. Fortunately there were neiter brides burned nor spectators gored during the frenzy and it made for some phenomenal photos! Overall it was a very memorable night for everyone that attended. Thanks again Mr. and Mrs. Mushrush!